There are many considerations that go into building a successful website and Internet presence for a local small business. As a local business owner who’s trying to generate more traffic, exposure, phone calls and customers from your website it’s important you have every advantage you can working in your favor. There are many aspects to web design and Internet marketing that many small business owners are simply unaware of. If your web designer never mentioned anything about these 3 key elements your local small business should have then it’s probably costing you money too. What Are 3 Things Your Local Website Must Have? 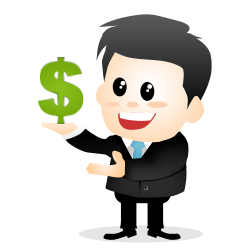 Small business owners should shy away from the web designers who are offering to design little 4 or 5 page websites. These small websites are insignificant to the monster we call Google because they just don’t really provide a searcher with a ton of value. If you’ve got a bunch of competitors with the same 4 or page websites then it’s even worse…. How do you stand out from out the crowd? The answer lies in building out a solid footprint of useful content for your website. This means creating individual pages for each service or product that your business provides and filling it with 300 – 1000 words of content that will provide value to your visitor. 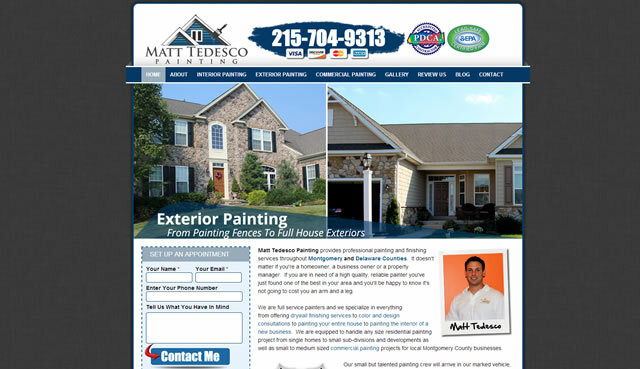 You would also want to create pages for your core service areas, whether these are cities, towns or local communities. This strategy can take the average 4 or 5 page website and transform it into a 30-50 page monster of a website that becomes a local authority. Think about it this way…. Every page of your website is like a fishing line. If you’ve only got 5 basic pages (poorly baited lines) out, your results will be dismal. With a 30 page site you’ll have the ability to carefully bait each line for the type of fish (prospect) you’d like that line to generate. Creating targeted pages for your services and service areas should be a core part of your local website strategy. This is probably the one area where we see the most mistakes on local small business websites. Even by professional web designers who should know better. The meta tags of your website are the underlying snippets that let Google and other search engines know what your specific page is about. The title tag of your website is literally the first thing a search engine bot will see when it visits your website and what your title says sends very strong signals to Google and other search engines about the topic of your page. 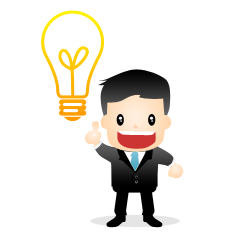 The meta description is read by the search engine bots next and this is generally the description that will show up in search results if somebody searches for your services. Your title tag and description should ideally read as a sentence. Your particular service and area you provide it in should be in the title too. Here are some example titles and descriptions for make believe local companies. Frank’s Plumbing is a full service plumber based in Qualicum Beach and serving the surrounding area. We specialize in drain repair and emergency plumbing. Looking for a reliable roofing contractor in Courtenay, BC? ABC Roofing Company is a full service roofer specializing in Asphalt Shingle repair and replacement. Here’s Why These Are So Important…. 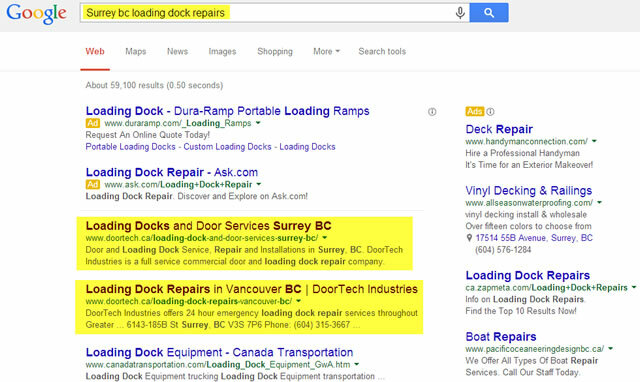 In the above example you can see our clients website ranked #1 for “Surrey bc loading dock repairs”. 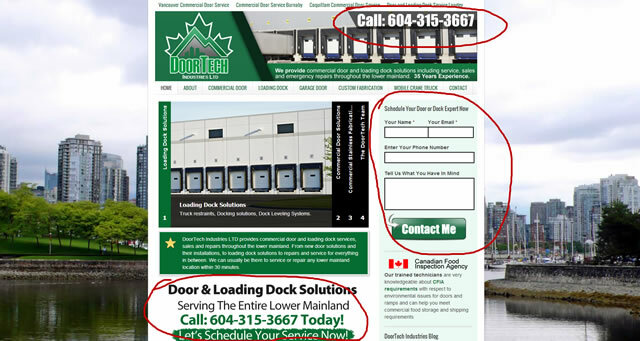 Because we’ve used proper page titles and descriptions the listing actually makes sense and is enticing to the searcher looking for loading dock repairs in Surrey, BC. Your website serves a purpose for your business right? It’s supposed to be generating phone calls, email inquiries and interest in your business 24 hours a day. If you don’t outright “ask for the conversion” you’re never going to get it. This is why it’s critically important for a small local business to strategically place their calls-to-action throughout their website. It’s no mystery for the searcher or web visitor as to how they need to proceed if they’d like to do business with our client. Always ask for the conversion in your written copy!!! When you are dealing with web searchers you’re dealing with a very fickle crowd. They can be on your site and leave your site in the blink of an eye so make it very easy for them to see how to contact you. A good benchmark for a local small business website is to have at least three (3) very prominent calls-to-action on every single page. Carl Sorensen is a Web Designer and Internet Marketer who works with local small business owners to help them develop a winning web presence that will become an asset for their company.